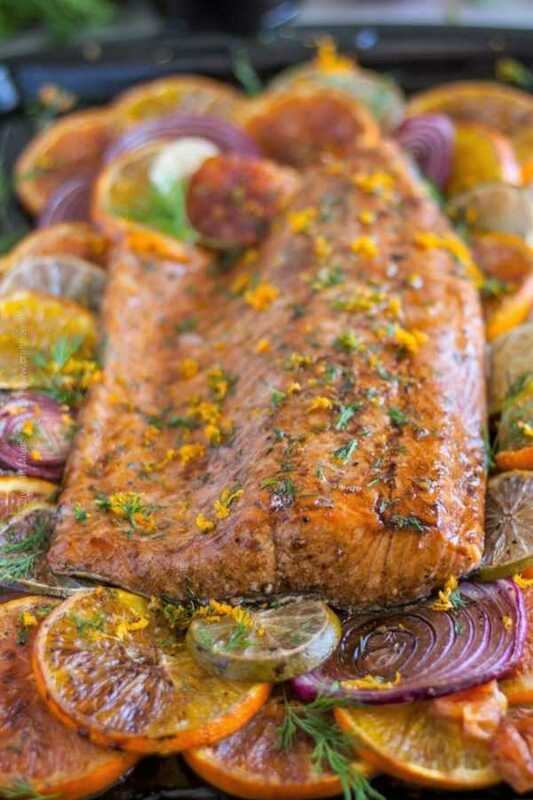 Citrus salmon glazed with beersamic or orange balsamic is a feast for the senses. Colorful and aromatic, sweet and sour, incredibly juicy and flaky. And less than half an hour away. 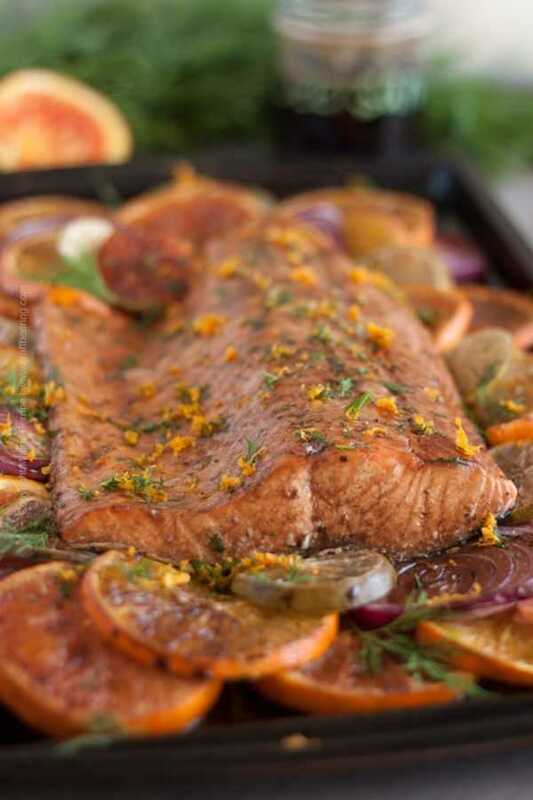 This recipe is for a baked, melt in your mouth tender citrus salmon fillet. When shopping for the fillet do not worry if you didn’t get a center cut piece, just try to get a piece that weighs about a pound and a half to serve four people (6 oz per person). Plan accordingly for a larger group. Presuming that you have a quantity of the malty, tangy reduction known as beersamic you can plan on using it for the glaze. Learn How to Make Beersamic. A good substitute is a simple mixture of orange marmalade with balsamic vinegar – mix 3 tablespoons of the marmalade with 1 tbsp of balsamic. Finally, you will need a variety of citrus fruit (see below for tips). You will also need an appropriately sized baking sheet and a brush to apply the beersamic reduction glaze or orange marmalade + balsamic mixture. North Atlantic salmon is especially well suited for baking and glazing because of its higher (good) fat content. The natural oiliness of the fish helps it stay moist during the time in the oven and beautifully stands up to the tangy flavors of the balsamic vinegar in the beersamic reduction and the citrus (or orange marmalade and balsamic mixture). 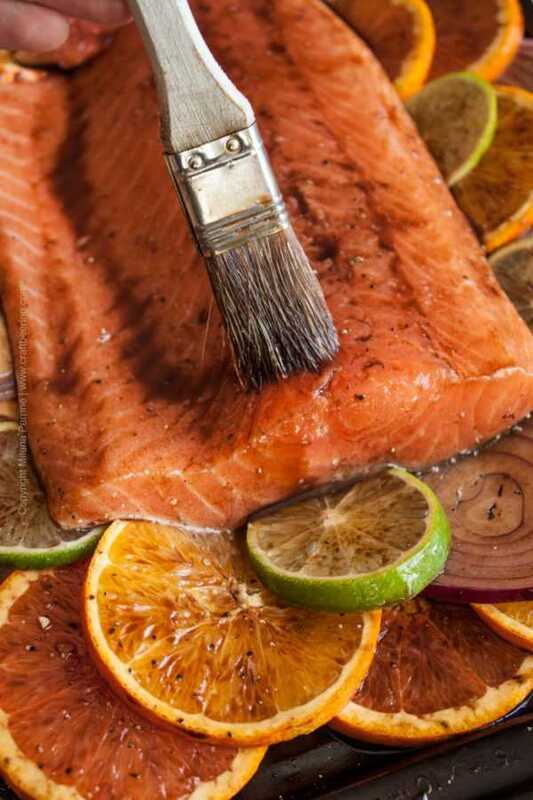 Additionally, North Atlantic salmon has a much milder flavor versus other types of salmon such as sockeye and does not overpower the contributions of the glaze. Select a balanced fruit variety or in other words less acidic. Just so that you don’t go over board with the sourness factor. To that end limes or Mayer lemons work better than regular lemons. Cara Cara oranges are perfect as are navel and Valencia oranges – they strike a great balance between sweet and tart. For some added sweetness (and beautiful color) I also like to add red onions – brushed with beersamic they caramelize fabulously. You will need to grease a baking sheet with oil and place the salmon fillet in the center. It is up to you if you want to peel the citrus fruit first or not. I like to wash it really well and leave it as is. Slice the oranges, lime and peeled red onion into rings and arrange around the salmon fillet overlapping a bit for aesthetic appeal (as shown above). Season with salt and pepper (both fish and citrus) and generously brush with beersamic reduction (or orange marmalade and balsamic mixture). Use a soft brush like the one in the picture below. Bake in a 375 F oven for approximately 20 minutes. At 15 minutes check the progress of the fillet (depending on its thickness and your oven’s strength it may cook faster/slower). The salmon is cooked when the internal temperature reaches 145 °F. You can also bake beersamic glazed salmon with red and golden beets added. It looks just as pretty and the deep earthy notes of the root vegetables come together really well with the beersamic’s sweet & sour. 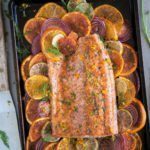 If you do decide to prepare beersamic glazed beets and salmon instead of a citrus salmon or a combination of both – you need to take into consideration that the beets cook much slower than salmon fillet. An easy way around this is to start by roasting the beets for 15-20 min so as to get them to a semi cooked state. 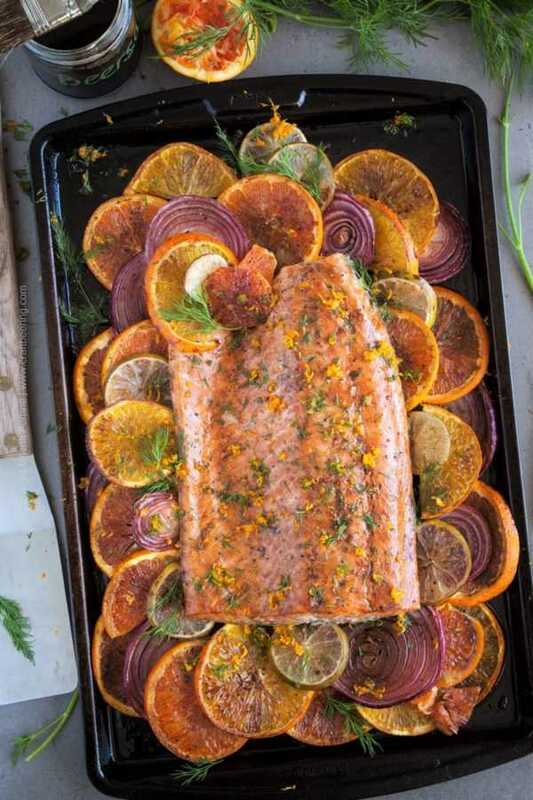 Next, turn down the temperature of the oven to a baking range (350 – 375°F), add the salmon fillet (and the citrus if going for a combination dish) to the baking sheet with the partially cooked beets, glaze everything with beersamic and place in the oven again to cook the fish and finish the beets. In terms of garnish, a simple sprinkle of finely cut fresh dill or fennel leaves combined with orange zest is visually pleasing and brightly fragrant. I do recommend that you try it. The beersamic reduction I used in this recipe was not thickened, however if you want to drizzle extra beersamic over the finished dish it is much better to use the thickened version. Consult our How to Make Beersamic post for the difference and preparation instructions. TIP: For an easy workflow, prepare a simple beersamic reduction first, separate and set aside a part of it to use as glaze and proceed to thicken the rest of the reduction to use for drizzling. This really is an impactful dish to serve at a casual dinner party, especially a buffet style one, where you make two or three different protein dishes and several sides. The citrus salmon fillet is very tasty when eaten cold too. Prepare a bowl of orzo salad with black olives, dill, red onions, add a piece of beersamic glazed citrus salmon and enjoy a vibrant plate. Another favorite is cold noodles with soy sauce and sesame (oil and toasted seeds). Grease a baking sheet with the oil and place the salmon fillet in the center. 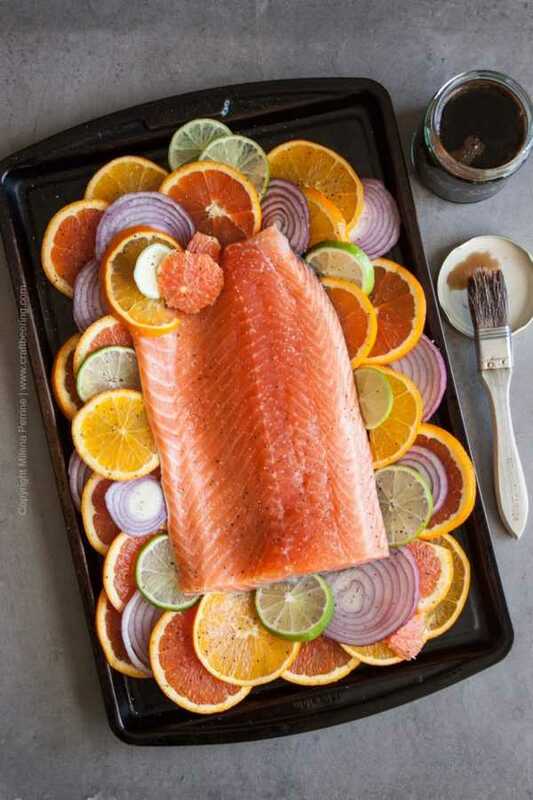 Slice the oranges, lime and peeled red onion into rings and arrange around the salmon fillet. Season with salt and pepper (both fish and citrus). Gently and generously brush with beersamic reduction (or orange marmalade + balsamic). Place in the oven and bake for approximately 20 minutes. At 15 minutes check the progress of the fillet (depending on its thickness and your oven's strength it may cook faster/slower). It is cooked when the internal temperature is 145 °F. Use the opportunity to flip some of the citrus slices and to apply another coat of beersamic glaze. Cook further if necessary or take out of the oven if already cooked (fillet cuts from closer to the tail will cook faster). Finely chop the fresh dill and mix with the zest of one orange. Sprinkle over the citrus salmon once it is out of the oven and serve. Thank you for sharing with us at MMBH. What a beautiful presentation for your delicious Salmon recipe! Thanks so much for sharing your awesome post with us at Full Plate Thursday. Have a great week and come back soon! I love finding new salmon recipes to try! Found your link on What’s For Dinner? Sunday Link Up. That salmon looks stunning resting on a bed of citrus fruits! Love dishes that are colorful as well as delicious, and in this case, also nutritious. We both love salmon and this is going to happen as soon as I get back home to enjoy it with Loreto. I’ll ask him to make the beersamic in the meantime 😉 . Great job!! I swear, sometimes I just “can’t even” with you guys. Meaning I can’t even stand how delicious this looks! You’re killing me ova hurr! I may have mentioned before my hubs don’t care for fish but screw it, I’m making this recipe. I’ll just cook up some chicken for him then nosh on this amazeballs recipe all by my self! Too funny:) I bet he won’t mind a beersamic marinated chicken. But what is it with men not liking salmon/fish in general? I mean…many of them do fish…Chris is all catch and release though, lol. Thank you, Christina! Well I’ll eat all of Chris’ salmon because it’s my favorite fish. This looks just delicious! My dad is the master of salmon cookery and I didn’t inherit that quality so I’m going to send this recipe to him as a hint for the next time I visit. I can taste it already! I never pass up a feast for the senses! I need to get going on my beersamic! My family will love this! My hubby is not a huge fan of salmon either, but I am so I can totally keep this for myself (and enjoy after meatless March 😉 ). There is something about citrus that I love too! I just picked up a huge ban of cara cara oranges at Costco last night. They’re my fave – so easy to peel and so juicy. I can imagine just how lovely they are with the salmon and that beersmic. North Atlantic salmon is my favourite variety. I do love that it’s a higher fat content. So flavourful and moist. I’m seriously starting to reconsider this whole meatless March thing, lol. Thank you, Dawn. Exactly! The best salmon is the fatty North Atlantic. I especially love it cured in the Scandinavian tradition. That is something to live for:) April is going to be a yummy month for you, lol! You can do March, I know you can. Thank you, Jennifer! The beersamic is so versatile, truly. I eat salmon pretty much everyday, but I always prepare it the same way, a little salt a little white pepper, 10 minutes later I’m a happy girl. I love citrus and salmon, this is the recipe for me. Fatty Salmon is always my jam, it stays moist and tends to be extra extra tender. Wow it looks like a seerious masterpiece. I’m going to try it out this weekend. Good for you, Mary! I could eat it more often too:) Hope you like this method of preparing it. Have a wonderful weekend!